Tom Sheeran’s Artists of the Loom: The Ayacucho Weavers of Peru is the first book to document this art form in a detailed work. These skilled artisans create beautiful tapestries based on pre-Hispanic designs interpreted with their own artistic vision. They use natural dyes with sheep’s wool or native alpaca yarns and weave on hand-built looms. The finished weavings are sophisticated works of art that the weavers sign with pride. The book, in both Spanish and English, tells about the weavers, their lives, their work, their weaving techniques, and the history of textiles in Peru from ancient times until today. Color photos tell much of the story. This Indiegogo campaign is to raise funds to print extra copies of the book for the weavers and for them to sell to support their local textile museum. Other copies will be provided to schools and libraries, and any extra funds will be donated to a local micro-lending project called FINCA Peru. 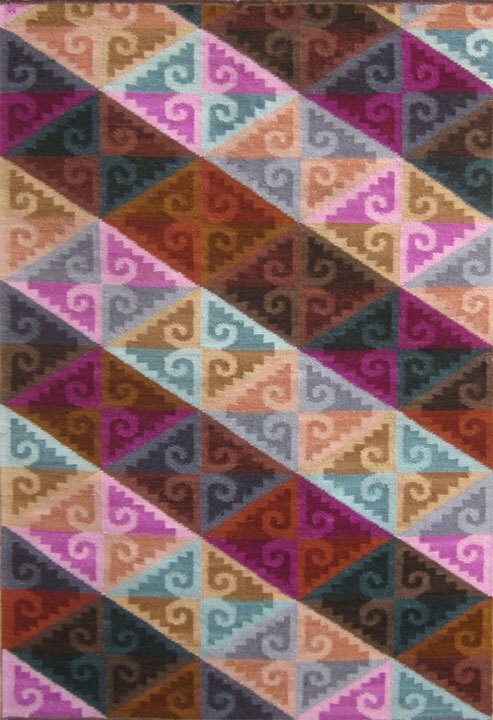 I became interested in Peruvian textiles during my first visit to Cuzco and Machu Picchu in 1980. I started importing handicrafts and folkart from Peru and have returned many times since. In 1986 I visited Ayacucho for the first time and met the weavers in person. I was impressed by their artistry and their perseverance in the face of poverty and civil war. I’ve continued to buy and sell their weavings ever since. My import business has always been a sideline, and more of an excuse to travel to Peru than a way to make a profit, with my goal mainly to sell more of the artisans’ work and give them a fair price. A couple of years ago I created a short photo booklet about Ayacucho weaving for a photography class project. Friends who had visited Ayacucho with me in 2008 encouraged me to expand it into a ‘real’ book, especially since nothing serious had ever been published on the topic. I spent more time in Ayacucho in September – October 2013 doing photography and interviews with the weavers; now the book is ready for publication. The text is in both English and Spanish to make it accessible to all. It contains more than 70 color photos of the weavers, their weaving techniques, and numerous examples of their tapestries. I also received permission from several museums to include images of ancient Wari and Inca textiles of the type that influence their designs. I’ve used lots of my own photos of everyday life in Ayacucho. 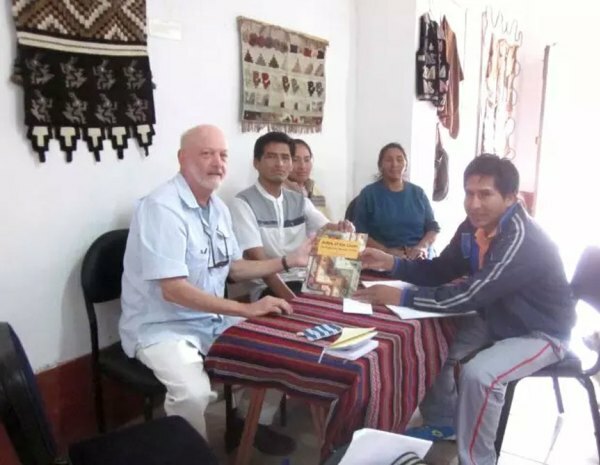 When I self-published my book Artists of the Loom: the Ayacucho Weavers of Peru in 2014, I also set up a crowd-funding website to raise funds to provide copies of the book to the weavers and others in Peru who had contributed to the project. I planned to give any extra money raised to charities in their community. The fundraising campaign was very successful, and in addition to providing books to the weavers and their neighborhood museum, I raised over $2000 more in donations. Last fall I went to Ayacucho to distribute these funds to 3 local groups. 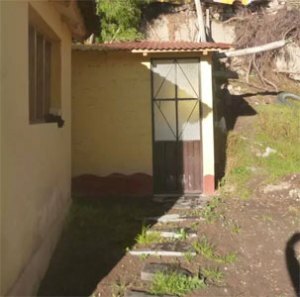 First was FINCA, which is a micro-lending and community development project. We gave them about $1100 for a new scholarship program for girls seeking post-secondary education. This amount will help 10 young women with living expenses for a year. I was gratified to be able to give back to this community after so many years of buying and selling their textiles. It was very rewarding to be able to help meet concrete needs for education, health, and nutrition in one of the poorest regions of Peru. It was especially satisfying that all these projects were initiated by the local community, not by outsiders. Checks should be made out to ‘AWAMAKI USA’: please write ‘FINCA’ on the line for notes. For full details and lots of video and photos, please visit the website (Donations made on the website are NOT tax deductible, but do offer perks/thank-you gifts instead). “Wari Colors”, 2′ x 3′ wool weaving by Alfredo Jayo. Edwin Sulca’s wife twining yarns together that have been dyed with different shades of cochineal, 1986. Alfonso Sulca, one of the most prominent Ayacucho weavers; in his gallery, 2006. Edwin Sulca with a customer from Hawaii in his gallery, 2008. Alex Gallardo at the loom, 2008. “Fox heads”, 4×5′ by Alejandro Gallardo, 2006. Dramatic use of various shades of cochineal, the most typical dye source for Ayacucho weavings. Ciriaco Sosa’s family workshop, 1986. Meeting with Textile Museum leadership, Sept. 2015. Museum bathroom unfinished – Sept 2015. Women from a nearby village waiting near the main Ayacucho city market, 2013.